One or more examples of each form of traditional rhetorical repetition used by Wordsworth is analysed below. This strategy is used by Wordsworth in a number of ways and frequently within the poem. No longer breathe . . . Here the repetition of "think on that . . . Pause upon that" is divided around the phrase "cease to stir". As a result, the repetition itself enacts the movement of the beating heart and of the breathing poet. A sense of the line metrically and rhetorically "breathing" holding and releasing its breath is made explicit as it develops. The repetition is important for the sense of "spread" it conveys. By repeating it, the impression of spreading occurs twice, as if in layers or ripples on a pool which overlap. Thus joy comes and passes as does sorrow. If one wrote instead "joy and sorrow spread" the sense of shifting, sequential movement is lost. An owner, and that owner I am he. In this example of anadiplosis, the claim to ownership is reinforced by the repetition. The repetition is redundant at a level of meaning but the statement is made grander, and the revelation more dramatic, by repetition (An owner – who? An owner – me). Repetition reinforces the poet's belief in the untutored shepherds of the region. The end line repetition is also metrically calming and reassuring as in another example, "But I am safe; yes, one at least is safe" (74). In part this is because there is a sense of enclosure and resolution to the line created by the final repetition. Within the bounds of this huge Concave . . . In this example, antimetabole combines with anaphora to create a highly repetitious sequence in an example of what Bruce Clarke calls "reciprocal redundance" (Clarke, 361). There is good reason for it, however, since what is being described is the movement (in the mind, eye or body) of the boy who wastefully yet with full enjoyment, roams all over the place. The final line also sets up a contrast between apparent freedom which nonetheless still lies within the bounded domain of the valley. So stinted in the measure of their grace . . .
By night, here only . . . The one sensation that is here . . . In fact, this is an interesting example of the self-contradiction of the speaker. The repetition with one word changed works to further emphasise negation (nowhere is found . . . nowhere can be found). However, this effect is undercut by the comment in parenthesis which suggests that the poet might be mistaken. Shall gain, must gain, if sound be my belief . . . Here the initial single statement sounds assured, as the poet convinces himself of his "genuine wealth" in choosing to live in Grasmere. As it continues however, the certainty slips with each change of tense from what is known to what is desired and needed, further undercut by the conditional which undoes any certainty even in the first utterance. There are quite a few of these used in Home at Grasmere. e.g. All in all; day by day; little and by little; from time to time. Because we use such phrases commonly in speech we tend to think of them as a whole and forget that they contain a repetition. These phrases give the poem a conversational feel, rather than using repetition for specific effect. However, the nature of the repetition within them is often temporal and when this is the case it works to re-enact the passage of time in a certain way – such as in the daily routine ("day by day"). A fairly common device which Wordsworth uses frequently in a range of ways. E.g. Wordsworth does not unambiguously employ this device often, but does use it across a line break which alters the effect of the rhetorical device (where this occurs the effect tends to be listed under "anadiplosis"). E.g. "Thou art pleased, / Pleased with thy crags"(136-137). An unambiguous example occurs with description of the sound of the birds' wings beating "Faint, faint at first" (305) or of the "dying, dying flame" (658) where immediate repetition gives the sense of the light (and life) gradually reducing. There is only one example of this in Home at Grasmere but a significant one. When Wordsworth describes the place as: "A home within a home / A love within a love" (261-262; 263) he not only repeats the noun in each phrase but also the structure of the phrase itself ("A - within a -"). The effect of this is to create a very tight syntactical structure so that the images of positive containment are reinforced. Note also the way in which the words "home" and "love" are visually similar as two four letter words with a different sounding "o" as the second letter. Technically, what I am calling "doubled repetition" is really just another form of "chain repetition" (see below). 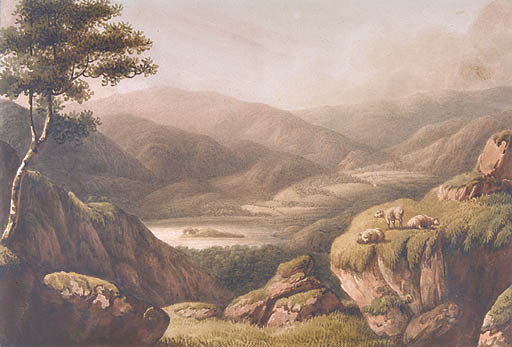 There is only one clear example of this in Home at Grasmere when Wordsworth describes the walk to Grasmere from Sockburn and the wintry weather around them: "Bleak season was it, turbulent and bleak". Here the inescapable dreariness of the weather is reinforced by the strong metrical stress on "bleak" at the beginning and end of the line. Elsewhere there are near examples where the same phrase is used at the beginning or end of a clause, but not just the same word, e.g. "It loves us now, this Vale so beautiful / Begins to love us!" (268-269). And we a solitary pair like them. Here, the two lines play in different ways upon the comparison of doubled isolation of the two swans and of William and Dorothy both in their new homes. As well as the repeated nouns of "strangers" and "pairs" (and the fact that pair is a double, repeated) there is also the repetition of the syntactical structure "They -- and we -- " and the interplay of personal pronouns around "They/we/them". Three forms of repetition intertwine in a remarkably compact space in order to bind the two new forms of life in the valley together.